Two main libraries are of particular interest to students of Second Language Studies. 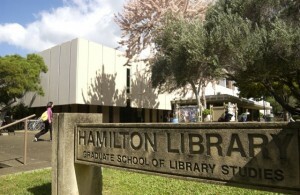 Hamilton Library contains the main graduate book, periodical, and microform collections, with specialist librarians and collections in such areas as Asia, Government Documents, Hawaiian, Maps, Pacific, and Rare & Book Arts. Be sure to familiarize yourself with all the resources offered by the library, especially learning the information from the Second Language Studies Subject Guide, as this will help you through your graduate program and future studies and career(s). Sinclair Library provides many study areas and the main holdings of music and architecture materials, and the University archives. It also has the University’s audiovisual center. The Reading Room occupies Moore Hall Room 572. It is a facility that is shared with the Department of Linguistics, our neighbors on the fifth floor. Both departments contribute acquisitions to the Reading Room, and share responsibility for monitoring the facility. In addition to the collection related to Linguistics, the SLS collection includes a) academic books on applied linguistics and language learning, b) textbooks for teaching various aspects of SLS, and c) SLS research and professional journals, as well as course materials placed on reserve for selected courses, and a small amount of other reference material. The Reading Room is not a lending library; materials do not circulate and can only be read or consulted during the hours the room is open, through monitoring by Linguistics and Second Language Studies student volunteers. Reading Room open hours are dependent on volunteers and posted on the bulletin board outside the door each fall and spring semester. Donations of items to the Reading Room are always welcome, especially English language teaching texts from foreign countries. Please leave donations in the designated box/shelf in the Reading Room. 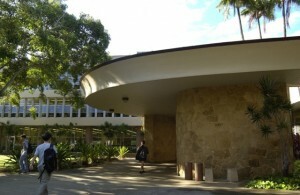 The Reading Room was established when the Master of Arts in Teaching English as a Second Language (predecessor to the MA in SLS) began in 1960. The East-West Center, which provided all of the students in the original interdisciplinary MATESL program, made funds available for a small library of teaching texts and materials to support the program. The collection has steadily grown from relatively few books housed in the original ELI/MATESL offices, which were located where the School of Architecture now resides. From there, the collection first moved to Kuykendall Hall with the MATESL program, and finally found its home in its present location in Moore Hall.